The Amazon rainforest is the most important patch of land on the planet. The trees have been called the lungs of the Earth and that's far more than just a metaphor: they absorb more than 2 billion metric tons of carbon dioxide per year, return oxygen in exchange and help regulate the climate of the Western Hemisphere in the process. The forest itself is the hottest of biodiversity hotspots, home to countless species of plants and animals that we have yet to discover  and even tribes of indigenous human beings who have never been contacted by the outside world. There's a reason that "save the rainforest" became a default slogan for environmentalism in the 1980s; saving the Amazon really did mean helping to save the planet. The good news is that over the past decade, we've been doing just that. After years of clear-cutting and slash-and-burn agriculture ate into the rainforest, deforestation has fallen to the slowest pace since government officials began keeping track in 1988. Just 2,443 sq. mi (6,327 sq. 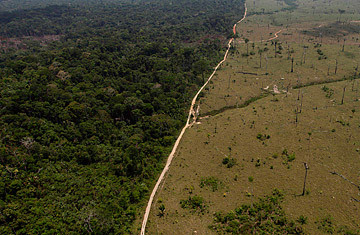 km) of forest were lost from August 2010 to July 2011  78% below the most recent spike in deforestation in 2004. While lower world prices for beef and soya and a stronger Brazilian currency have helped reduce the market incentive for clearing forest for farming or cattle-raising, a recent analysis by the Climate Policy Initiative found that at least half of the recent drop in deforestation was due to tougher government policy. International pressure played a role in that, but Brazilians themselves made the real decision to protect their Amazon. That progress, however, could be lost. Last month Brazilian President Dilma Rousseff was faced with a tough choice. The lower house of Brazil's National Congress had passed a revision of the country's Forest Code, pushed by the "ruralistas"  legislators representing Brazil's powerful agricultural interests  that would have severely weakened legal protections for the rainforest, even granting effective amnesty to landowners who had illegally deforested areas before 2008. According to the government's Institute for Applied Economic Research, the new Forest Code might lead to the loss of as much as 190 million acres (77 million hectares) of forest. Rousseff had until May 25 to decide whether or not to sign the bill. Environmentalists  as well as some sectors of urban Brazilian business  wanted her to veto the thing in its entirety while the ruralistas, who believe a new Forest Code was needed to support Brazil's burgeoning agricultural industry, demanded the whole package. It was a momentous decision for Brazil's President  especially since the country was set to host the Rio+20 Earth Summit at the end of June. On May 28 Rousseff issued a partial veto of the revamped Forest Code  a compromise that managed to annoy both sides. She removed many of the bill's more controversial sections, including the amnesty provisions, and restored obligations for landowners to recover forests that were cut down illegally. But environmentalists inside and outside of Brazil have been mostly unhappy with Rousseff's half-a-loaf approach, warning especially of the dangers of deforestation along riverbanks, which is likely to encourage flooding. Previously, landowners had to keep 33 to 330 yds. (30 to 300 m) of intact forest alongside rivers, but the new rules will only require 5 to 30 yards (4.5 to 27 m). The new law also reduces the legal reserve requirement  the proportion of land an Amazon property owner is required to maintain as forest  and allows landowners to plant commercial species like oil palm or coffee as part of a reserve. "In environmental terms, the law should have been vetoed completely," Luiz Antonio Martinelli, an agronomist at the University of Sao Paulo, told the Folha de Sao Paulo newspaper. "But we know that would be very difficult politically." Indeed, a full veto by Rousseff would have been seen as a declaration of war on the ruralistas  and in Brazil, just as it is in the U.S., Big Agriculture has political muscle to spare. As unhappy as many of the environmentalists are, the farm lobby has already said it will challenge Rouseff's partial veto in court. (Brazil's Congress could overturn the veto, but that seems unlikely.) But what will be even more important than the letter of the Forest Code  however it's eventually formulated  is whether it will actually be implemented. The Amazon is Brazil's Wild West, and the government's reach from the capital in Brasilia often exceeds its grasp. Enforcement of even the older, tougher forest law in the region was scattershot, which doesn't bode well for the pace of deforestation under a more lenient code. If there's hope, it's that Brazil itself is changing. As it grows richer  thanks in part to massive oil finds off the Atlantic coast  the country will become less dependent on basic agriculture, which could help build domestic support for slowing deforestation. Twenty years ago, when it hosted the first Earth Summit, Brazil was a financial mess, a weakling on the global stage suffering from hyperinflation. Today it's a regional heavyweight with aspirations for global influence  with a per-capita GDP that surpassed Mexico's in 2010. What's more, whatever the size of Brazil's agricultural sector, modern cultivation methods allow soya farmers and cattle ranchers to get more out of every acre, reducing the need to clear more forest for farm or pastureland. The delegates at the Rio+20 summit later this month will talk optimistically about the ability of the international community to tackle global environmental challenges in unison, but today the successes and failures that count most still occur on the national level. Brazil should lead by example, and it can start by better protecting its most valuable  and most destructible  possession. MORE: Goodbye Nuclear Power  and Hello More Carbon?